Imaging Sciences International is pleased to offer Quick Scan, the lowest available dose 3D scan of the full dentition. With Quick Scan, the patient's entire dentition can be imaged in 3D for only 27 'Sv'the lowest dose for the capture of both arches offered by any cone beam manufacturer in the dental market. Especially useful in orthodontics, the Quick Scan cephalometric-height mode captures all anatomy, from chin to nasion'landmarks required for orthodontics, in 3D for 45 'Sv. 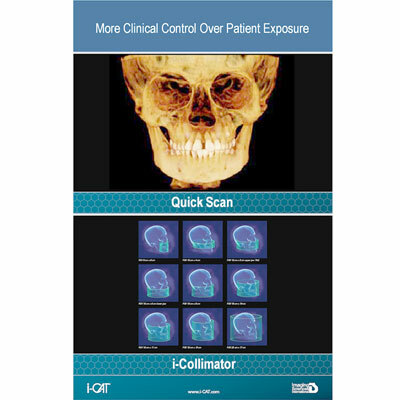 These Quick Scan options provide more information for initial workups and progress checks than 2D pans and cephs while still maintaining a comparable level of dose.